Felicten was severely malnourished when her grandmother brought the 8-month-old child to a Samaritan’s Purse supplemental therapeutic feeding center. In their Nigerien village, breastfeeding was a limited practice due to misunderstandings about its health benefits. The taboo nature was rooted in cultural and societal beliefs that breast milk isn’t good for babies. As a result, most children were given depleted diets of unclean water and foods that they weren’t developmentally ready for, which provided barely any nutritional support. 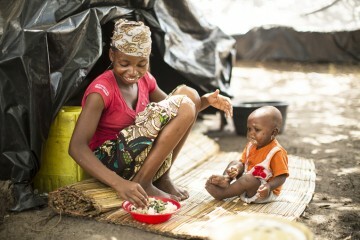 Mothers all over the world have received supplemental food for their hungry babies, including this mother in Mozambique. Niger is one of the poorest countries in the world. The economy depends mostly on agriculture, but extended droughts bring less food and more malnourishment. 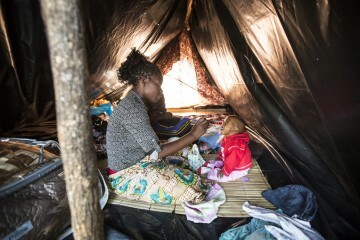 The country has one of the highest infant mortality rates in the world. 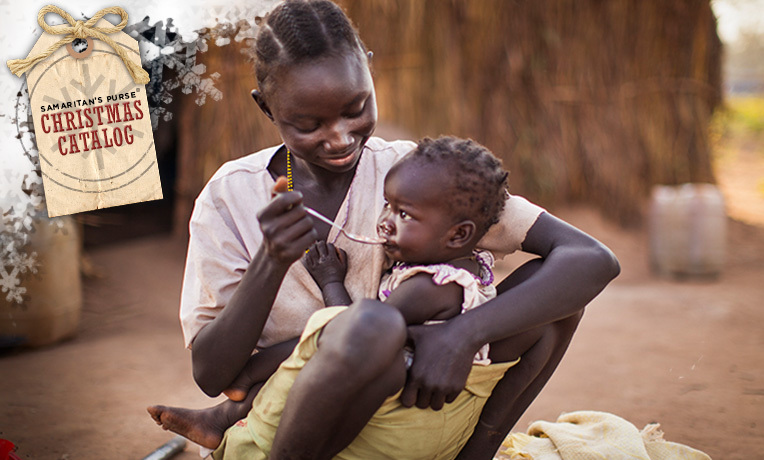 To combat those statistics, Samaritan’s Purse gives children like Felicten therapeutic food substances to help quickly increase their weight and nourishment. Felicten was vomiting and suffered from severe diarrhea due to her malnourishment, but after four weeks at the center, she was well on her way to recovery. Two-year-old Ibrahim also benefited from therapeutic foods, and the child’s mother, Dioura, said she would use the principles she learned through Samaritan’s Purse to make sure the child doesn’t fall back into malnourishment. Dioura said that after just two weeks at the feeding center, she noticed a difference in the child’s alertness and overall activity level. In the same village, Samaritan’s Purse is training women on how to properly nourish their children after they regained health. These women then take this knowledge and share life-saving practices with their families and community, further preventing future issues of malnourishment. Samaritan’s Purse does more than provide these women with tools and knowledge to feed their families. Our ministry team worked alongside the nutrition team in the village. They showed the Jesus film, produced skits, and did one-on-one relational evangelism. More than 200 people watched the drama productions, and 31 people, mostly children, accepted Christ. The women, especially, were interested in the programs, although they often didn’t speak up because confessing their faith could mean divorce or other persecution. As more villagers come to Christ, they can be more open about their newfound faith. 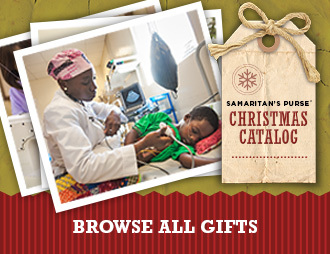 Feeding a baby for a week through the Samaritan’s Purse Gift Catalog doesn’t just put a bandage on the problem. Our program opens the door for women to learn new ways to help improve and maintain their children’s health while also opening the door to proclaim the Gospel.